Saturday night I watched the ESPN 30 for 30 documentary, “I Hate Christian Laettner.” I was fascinated by the sub-culture surrounding one person, and specifically the hate directed at him. For those unaware, Christian Laettner was a superstar college basketball player at Duke University in the late 80’s and early 90’s. He is most known for what might be the iconic college basketball moment in history – the shot. Laettner and his Duke Blue Devils trailed by one point the underdog Kentucky Wildcats with 2.1 seconds remaining in overtime. The winner of this game would move on to the Final Four. Laettner, standing at his own free throw line, received a pass from the opposite goal, faked one way, turned the other, shot and won the game. This highlight is shown over and over and over every year in March. 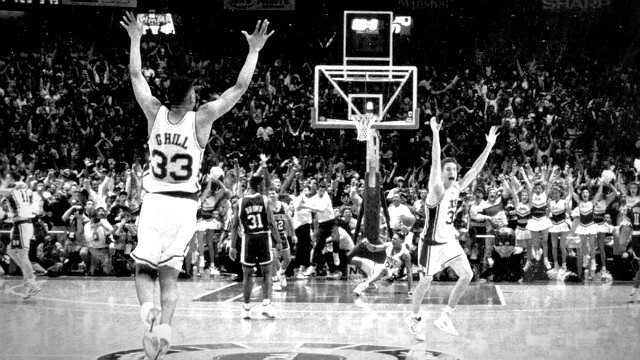 Kentucky fans will argue Laettner should never had the opportunity to take that shot. Earlier in the game, he intentionally stomped on the chest of a Kentucky player. Though given a technical foul, Christian Laettner was allowed to stay in the game. The rest is, as they say, history. Many Kentucky fans still have not forgiven Laettner. They hate him. The documentary covered this famous event, but it delved deeper into the college career of Laettner. This feeling of hate for him built from the time he was a freshman and culminating in that one play. It showed how he was taunted by both opposing players and fan bases. It seemed as if everyone hated Laettner. Do you ever feel like that in your life? Maybe it’s whispers behind your back at work. Perhaps it’s a dirty look at a family gathering. It could be an actual confrontation by someone close to you in your life. Sometimes when it’s just the right person, it feels like everyone truly hates us. Sometimes there is a group of people aiming for our heads. How we respond in these moments define our character. David experienced more than his share of hate. Reading through his story in 1st and 2nd Samuel, it seems most of his life is responding to haters. He is hated by his brothers, his king, his son, his enemies and more. Yet David’s response is consistent. He never fights to defend himself. He never lashes out. David turns to God. He knows his hope, help and strength are in the Lord. This attitude isn’t easy. Many times you will be justified in responding in kind, but the results won’t be what you want. Things won’t change, and more importantly your heart will begin to harden. Best of all, you will know His sanctuary will remains open for you. Finally, my suffering, my hardship, my pain at the hands of those who hurl insults at me is not about me. It’s about Jesus. I suffer with Him. I suffer for Him. If I allow it, my suffering builds my strength through Jesus. So they hate you, take pleasure…it’s for Christ, and you will be strong! God is your defense, He is faithful, and His sanctuary will always be available. Thanks Bob. Something I think we learn as we age. I have a feeling I’m going to continue to learn this the hard way.